"Mustard based sauces are definitively South Carolina. This one will definitely satisfy your needs. This is for the big fatty ribs, not the baby backs. Do not trim the fat from the ribs. This method renders out fat and keeps ribs moist. If you do not have a smoker available, this can also be done in the oven." In a medium bowl, whisk together the brown sugar, lemon juice, white vinegar, cider vinegar, Worcestershire sauce, molasses and mustard. Season with granulated garlic, salt, pepper, red pepper flakes, white pepper and cayenne pepper, and mix well. Set aside. Preheat an outdoor grill or smoker to 225 to 250 degrees F (110 to 120 degrees C). 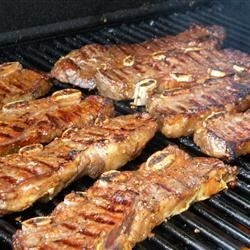 Rub ribs liberally with barbeque seasoning, then place them in the smoker or grill, and cover. Cook for 4 hours, or until very tender. The meat will easily separate from the bone. Baste ribs with mustard sauce liberally during the final 30 minutes. Heat remaining sauce to a boil, and serve on the side. Dissapointing. Tasted like mustard, but not like the Carolina bbq sauces I recall. I will stick to the Carolina Treat branded bottled sauce for now. I really enjoyed your recipe it was very tasy and a little spice and my family loves spicy foods but it wasn't over spicy I thought it was very exclent. Super good! I'll use this recipe in my regular grilling rotation from now on! Thanks for submitting this.